From the Stetson Co. website, circa 2015. Stetson University was founded by Henry DeLand in 1883 as DeLand Academy and was chartered in 1887 as DeLand University. However, by 1889 the DeLand University Board of Trustees changed the name to Stetson in appreciation of John B. Stetson for both his financial support and the business experience and acumen he brought to the university’s administration. Since that time, Stetson has embraced its history and in one form or another, hats have figured into our culture. The Stetson duPont-Ball Library has a special collection of more than three dozen Stetson hats. 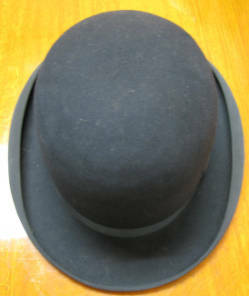 The majority of them date back to the 1930s, but the oldest is a black derby dating back to 1903. 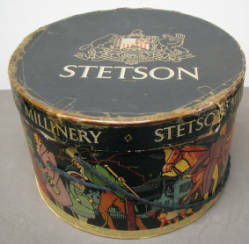 The collection includes Stetson hats and their signature hat boxes, many of which came from the Stetson family and from Stetson alumna through the years. Through a partnership with the Stetson Hat Company, the university is offering an opportunity for members of the Stetson community, students, faculty, staff, parents, alumni and friends, to pre-order and purchase a limited selection of Stetson Hats. The hats are available a few times throughout the year. If you ordered a commemorative Commencement hat, please stop by the University Marketing Office (145 E. Michigan Avenue) to pick up your hat! Please be aware that hat orders are non-refundable as these hats are made for Stetson University at special pricing. All hats ordered on Hatter Saturday will be shipped directly to Stetson University and will be available for pick-up at the Stetson Hat table on Move-In Day just outside the registration area in the Rinker Welcome Center. Please be aware that hat orders are non-refundable as these hats are made for Stetson University at special pricing. No additional orders will be accepted for Move-In Day delivery after April 13, 2019. Order your Stetson hat today! For current information about the Stetson Co., visit the Stetson Company website. To see their current hat selection visit Hats. For questions or more information, please email stetsonhats@stetson.edu or call (386) 822-8929.